A creamy eggplant dip with the bite of garlic and an almost airy fluffiness, accented with nutty olive oil – sound familiar? Think of Mutabel as the fraternal twin of Baba Ghanouj: nearly identical ingredients, expressed just a bit differently. If you didn’t have them side-by-side, one could easily mistake them for one another. This highly customizable recipe is not only amazing, but it is nutritious and can be adjusted to suit vegans, calorie counters, and paleo eaters alike. I’m not a huge fan of savory breakfast foods, but during my trip to Oman, my morning breakfast buffet had a wonderful, savory dish labeled, Mutabel, looking suspiciously like baba ghanouj but topped with pomegranate seeds. Imagine my intrigue when it turned out to taste almost identical. creamy baba ghanouj. 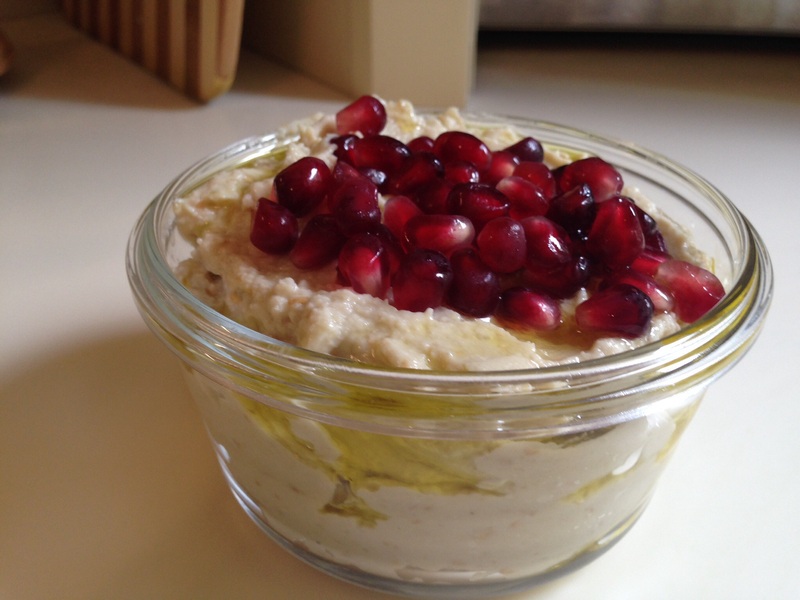 I’ve always loved baba ghanouj, but I’ve been a bit too intimidated to make it. Call it a working with eggplant mental block. But after the mutabel, I knew I had to tackle it. As I researched, I wasn’t surprised to find many different recipes for baba ghanouj, but few for mutabel (also spelled moutabel, transliterated from Arabic). Apparently, yogurt is the defining characteristic of mutabel. Armed with that knowledge and some helpful tips from two websites I must credit: http://mykitchenantics.blogspot.co.uk and http://actioninkitchen.com, I tinkered and came up with this recipe. It was far less difficult than I believed – though it is quite messy. The beauty of mutabel/baba ghanouj is that it is easy to start with a base, and then adjust proportions of the seasonings to suit your own tastes. I absolutely will make this dish a personal entertaining staple now! You’ll note that this recipe calls for both red onion and a not insignificant amount of garlic. Should you want to preserve everyone’s dignity after eating it, you may wish to omit the onion or reduce the garlic. With three eggplant, though, I didn’t find the garlic/onion to be too overwhelming, but it does linger. If you love tahini, you can adjust upwards. Want to go vegan or strict paleo? Omit the yogurt and replace with two (or more) tablespoons of extra virgin olive oil (yes, the extra virgin does make a difference. No joke!) Want to add heat? Add more cayenne – or give it a North African, red pepper kick with two tablespoons of harissa. At serving, choose between the Arabic tartness of sweet pomegranate seeds or the lemony Levantine/Mediterranean zata’ar seasoning blend. If you happen to have sumac on hand, that is the most traditional garnish in both regions. Set broiler to High. Wash eggplant; cut in halves. Brush with olive oil to coat – to prevent sticking. On a baking sheet lined with aluminum foil, place the eggplant halves, cut side down. Set on the top rack of the oven and broil for 30 minutes. 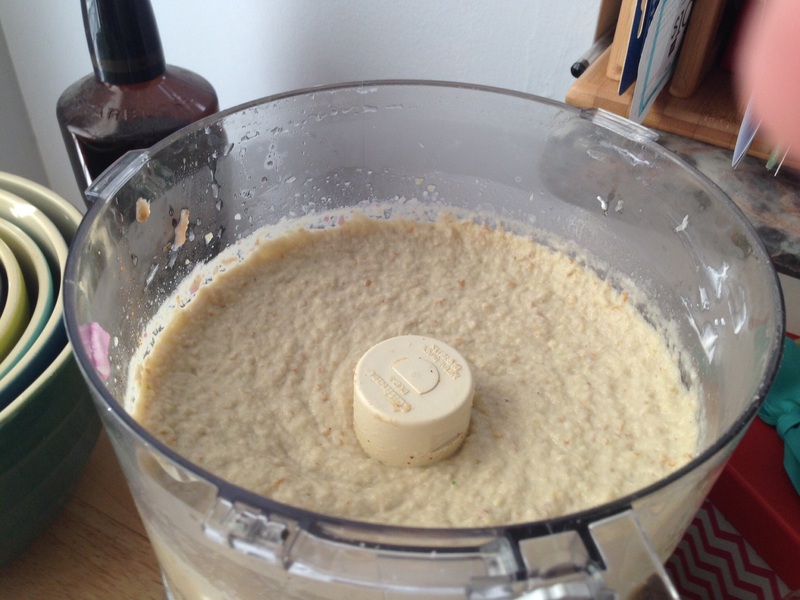 Meanwhile, place the garlic, onion, tahini, lemon juice, and yogurt in a food processor, blender, or mixing bowl. Set aside. When the eggplant is finished broiling (30 minutes; blistered skins and soft insides), remove from oven. Transfer eggplant into a gallon-sized zipper-sealed, plastic bag. Seal and allow the eggplant to steam in its own skins and heat for 15 minutes. Drain excess liquid from the bag; you may wish to reserve a few tablespoons of the liquid to add back later to thin the puree. Remove and peel the skins; they should come off easily by hand or scraped with a knife. The eggplant should amount to about 3 cups. Transfer peeled eggplant flesh to the food processor, blender, or bowl. Blend or use an immersion blender to puree all ingredients. Add salt and pepper to taste. Chill in airtight containers. Garnish with a generous drizzle of olive oil, pomegranate seeds, and or zata’ar. Serve with pita or crudites; sugar snap peas are one of my favorite accompaniments. I’ve just searched for mutabel to see the ingredients, as I’m having it for my lunch, and yours was the first site on the list. Spookily, I too am eating mine in Oman. Where did you have yours? 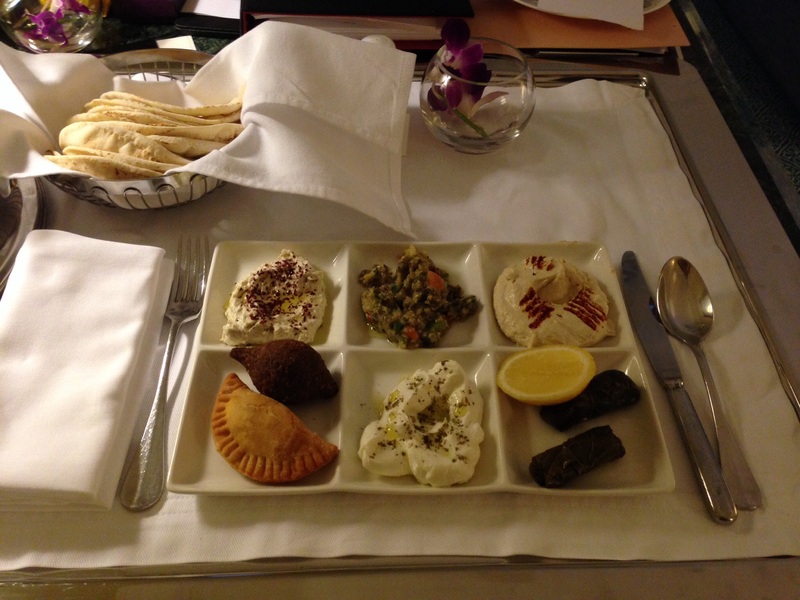 The Radisson has an excellent meze that looks like your photo. I had it in a few places, but notably at the Grand Hyatt in Muscat! Thank you for the comment!